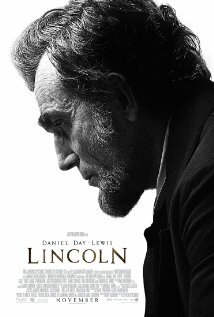 Lincoln covers the last period of Abraham Lincoln’s life as he attempts to pass an amendment through Congress abolishing slavery before a Civil War peace treaty makes such a prospect impossible. It is a riveting dilemma: peace vs the end of slavery. Daniel Day Lewis’s Lincoln is a complex messiah and, more than anything, a good man. His compassion for people and his wisdom shine through in a superb performance. It is also a film extolling compromise. The sort of compromise that would lead Lincoln to approve buying votes, playing games with words and truth, and which leads the idealistic radical Stevens to finally deny racial equality to help the amendment pass. If the message is that the end justifies the means, it is a message I disagree with. But as much as a message it is drama of the best kind: a portrait of good people torn by impossible dilemmas. Great review Nathan. Didn’t love the movie, but definitely had a good time with it and loved every second of Daniel Day’s performance.